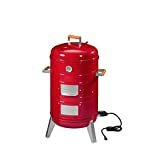 This cool new Batavia 4Grill is a multi-functional 4-in-1 BBQ barrel that combines a charcoal grill, a smoker, a slow cooker, and a fire pit all-in-one. While it may appear to be a full barrel in size, its versatile, configurable design allows it to be quickly converted from one function to the next and, in the end, it can be compactly stored down to 1/3 its size for portability to and from camping trips or the beach or for space-saving storage. 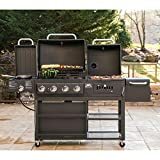 It features a stainless steel grilling grate that can be removed for vertically smoking meats, fish, and more from the included ceiling hooks and cross brace, has a vented steel lid with exterior temperature gauge, a heat resistant galvanized steel base plate, heat-resistant handles, a steel water pan, and a steel charcoal bowl. Check out this video to see a demo of how the segments can be all combined together.